It's hard to go to any restaurant these days without seeing mushrooms on the menu. These tiny fungi (not vegetable!) are at the top of the popularity list, and for good reason. The publicly acclaimed "superfood" has an incredibly dynamic resume that includes more than truffle pizza. Here's what you didn't know. Chances are, you're among the 85% of Americans who are deficient in vitamin D. Similar to humans, mushroom produce vitamin D when exposed to sunlight, making them the best vegan source for the vitamin. Supermarket-sold Portobello mushrooms typically contain about 400IU of vitamin D. The recommended daily amount for individuals under 50-years-old is 400-1,000IU. Historically, mushrooms have been used to create an array of color dye. By combining with a particular solvent fluent, nearly any color of the rainbow can be drawn out from the fungi. For example, mixing the meadow mushroom with salt water can produce a yellowish-green color. The lobster mushroom combined with ammonia produces pink. For many plant-based eaters, mushrooms serve as a great meat replacement, due to their umami flavor and meaty flesh. You may have thought of the classic Portobello cap, which is often seen as a burger or sandwich replacement, or as a steak, such as our Portobello Steak Dinner. There is another variety of the genus Laetiporus sulphureus, that is considered “chicken of the woods,” due to its distinguishable meaty flavor. It is impressively sized, and easily noticeable by its rippling layers. Some have described its flavor as lemony, meaty like chicken; others more like lobster or crab. Not all mushrooms are safe to eat. Probably the most well known of these is the Amanita muscaria, otherwise known as the mushroom powerup from the video game Super Mario Bros. If eaten, it will cause a “trip,” leading to hallucinations, nausea, twitching and drowsiness. However, the primary side effect is called “micropsia,” which is a condition that makes surrounding objects seem smaller, giving the subject the sensation of growth. We all know its healthier to eat more plants, especially of all different colors, but mushrooms are lacking color, and not even considered a plant. Mushrooms belong to the Fungi kingdom, and do not utilize chlorophyll like plants do to metabolize, therefore lacking phytonutrients. However, they do produce significant amounts of vitamins and minerals. Mushrooms contain selenium, which fight oxidative stress, reducing the risk of cancer. A large Portobello mushroom can contain more potassium than a banana, which plays a role in cardiovascular health. Their high fiber content makes them an excellent food to lower blood glucose levels—optimal for diabetics. 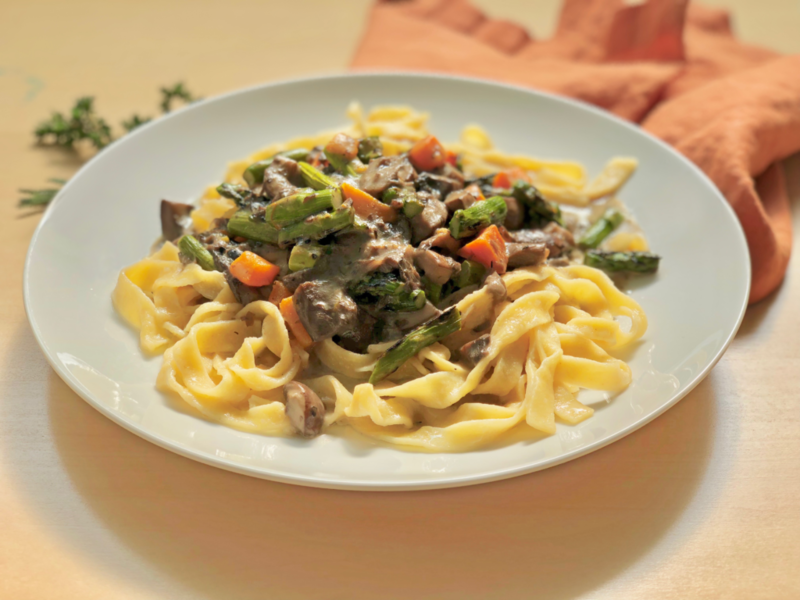 Take advantage of the healing and superfood benefits of mushrooms in our brand new Mushroom Stroganoff.